Physical stores are hardly going away. Retailers like Apple, Costco, Nordstrom, TJX, Dollar General, H&M, Ulta, Dollar Tree, Aldi, and Sephora are not only thriving, but plan to open thousands of new stores over the coming years. The retail industry continues to grow. Even in physical stores, overall sales continue to grow, albeit at a far slower rate than online shopping. However, the changes happening in retail are far more nuanced than something we can derive from a single statistic. The percentage of e-commerce sales varies tremendously by product category, from around 2% for groceries to more than 20% for apparel to the overwhelming majority of sales in categories where products can be digitally delivered, like music, books, and games. What’s more likely is that sometime in the future we will hit “peak ecommerce.” That means we reach the maximum percentage of online sales, what some might describe as a hidden barrier, that can’t be crossed. For me, peak ecommerce is a useful working theory because it begs the questions – how long until we reach it, and how high will it go? Is there such a thing as peak ecommerce? Let’s start by asking what it’d look like to have 100% of our retail purchases in the U.S. done online. Most of us would agree that this is not a likely scenario. Yes, there may be scenarios where we still have stores, restaurants, and shops and every purchase is made through a personal device, but making a payment online is not the same as making the entire purchase online devoid of any retail experience. If we consider the social nature of shopping and the number of places we frequent on a daily, even monthly basis, it becomes hard to imagine a world without markets. For these reasons, and more that I’ll explain below, I would be hard pressed to find an argument for ecommerce to ever go above 30%, and it may indeed top out somewhere below 20%. That said, retail is a brutally competitive marketplace that is not well described by a single data point. How much will automated delivery affect your desire to purchase products online? Are we facing a retail apocalypse? There are still many who believe that most shopping will ultimately be done online, that commercial districts with brick-and-mortar stores are doomed, and that anyone who doesn’t agree with them is a relic of the past. On the other end of the spectrum are the physical store cheerleaders that acknowledge the retail climate is changing, think traditional retail will pull through because, retail itself is still growing and after all the hype, even now, ecommerce only represents a meager 10% of all retail. Neither of these are safe assumptions in our rapidly changing world. Every aspect of the buying-selling process is getting rethought, experimented with, tweaked, reengineered, and reimagined. Our next generation retail pioneers are already in the process of dissecting and reassembling concepts of ownership, first impressions, product placement, purchasing environments, payment schemes, product lifecycles, delivery methods, the human-product relationship, and even the value and nature of possession. In the past, consumers had relatively few options for finding and purchasing an item. Storefronts, catalogs, mail-order, tradeshows, and traveling salesmen accounted for most of our options. Today, Amazon alone has roughly 1.8 million sellers adding another 1.3 million new products every day. Around 50% of all sales on Amazon marketplaces come from third-party sellers. This means people spot a product on Facebook, Twitter, Instagram or LinkedIn before making it to the purchase page on Amazon. If you happen to be an inventor and develop a new product, does this mean you should focus on Amazon as your primary channel of distribution? Not necessarily. Amazon still lacks the intimacy of talking to a sales person, having a product demo happen in front of you, feeling the fabric, tasting the food, smelling the fragrances, laying down on a mattress, having a person help you understand your choices, and personally testing the results. By its very nature, retail will forever be a fragmented multi-option, multi-channel industry where the true innovators are constantly rewriting the rules of engagement. Even though regional malls, and their department store anchors, have been on the decline for more than two decades, the shopping mall industry is still quite viable. The first threat to malls came in the form of big-box stores and discount mass merchandisers. The latest wave of disruption has come primarily from a surge of off-price and dollar stores. So while it’s easy to point the finger at online shopping, it’s only a piece of a much larger equation. At the same time, due to a surge in popularity, malls had gone through a rapid over-building phase and a correction of some kind was inevitable. With shifting demographics and traffic patterns, many older malls lost the “relevance” battle to new malls. As a general rule, a newer mall with more desirable tenants will always win over an older mall that still appeals to yesterday’s trendsetters. Finally, A-list malls are doing very well. This includes a group of 270 or so malls that represent about 20% of all locations, but they generate roughly 75% of total mall revenue. For the most part, these malls are unaffected by the closure of anchor tenants, and any specialty shop vacancies are quickly snatched up. This is not to say that malls won’t die a painful death or be radically transformed. Rather, our need for finding an endpoint seldom matches with the reality of what’s happening in the trenches. More than likely, malls will still exist in one form or another even a thousand years from now, but consumers will interact with them in radically different ways. How will ecommerce change in the future? The number one challenge of traditional retail has always been driving customers to the store. As we move into a highly mobile marketplace, businesses can drive to where the customers already are. In this scenario, products are not purchased, but simply used for a time and returned. This already exist on some levels but may be expanded in unusual ways. Taking the “blue light special” to the next level, Slashcasters are a new breed of pitchmen geared to entertain audiences at retail showcases. Slashcaster events will be framed around our growing need for unique one-of-a–kind entertainment designed specifically to create an over-the-top shopping experience. With this kind of personalized shopping, your private team of professionals will show up at your door to step you through every detail of specialty products ranging from clothing, to shoes, to makeovers. People love to talk to the experts and find answers for those nagging questions that create a cloud of uncertainty around most consumer products. The Apple Stores are a perfect example of an “experts shop” because each of their employees is an expert on the products they sell. Where customers witness the making of products being sold. A maker district can best be described as a cross between an artist colony, farmers market, woodworking shop, music festival, bakery, brewpub, and brainstorming session all happening in the same space. It’s all that and more. Imagine an engaging model working as a human billboard, wearing a 4K video t-shirt, where the t-shirt is looking at the audience as much as the audience is looking at him or her. The model’s primary objective is to garner impressions and sell products, as many as possible. Most people are already shopping for surprises, so in this type of discovery-your-own-adventure shops, participants are treated to a sprinkling of breadcrumb experiences that will help lead them to the ultimate and final pieces of the puzzle. Every item for purchase is guaranteed to be original, one-of-a-kind merchandise. Set up as a large open-space building, every morning dozens, maybe hundreds, of mobile vendors show up and set up shop in new and different configurations. Mobile malls are similar in many ways to the Docking Shops. Docking shops will be designed so mobile businesses can “dock” and expand into a larger commons area. First envisioned for rural communities where the customer base is too low to warrant a permanent location, a one-day-a-week storefront in five or six communities might be a perfect arrangement. One of the major expenses in traditional retail has been managing inventories and shelf space. Look for a new breed of retails shops that carry no inventory, only product demonstration stations with the ability to order on the spot (to receive a discount). How long before we reach peak ecommerce? After studying consumer dynamics and examining our human need for social interactions, it looks to me like we will reach peak ecommerce by 2030 and peak somewhere around 20%. At the same time, much our current retail environment will transition to experience-based products with a heavy emphasis on shared connections. Naturally, when it comes to retail, consumers are in control. They decide what to buy, where to buy, when to buy, and how much they’re willing to pay. 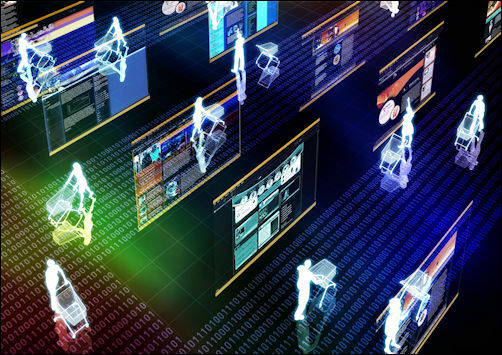 In a connected world, where information is ﬂuid and transparent, retailers become actively engaged in the global conversation. If not, their customers will begin the conversations without them. Thanks for the fun article. I hadn’t imagined such a variety of possible retail outlets. The Amazon tech stores are almost demo only already.